What is a Tesla Turbine? A Tesla Turbine is a type of turbine engine that uses a series of smooth disks, instead of fan blades to turn fluid motion (air, water, etc.) into rotational mechanical work. It was invented and patented by Nikola Tesla, more widely known for his work with AC generators and motors, in 1913. Tesla theorized that traditional turbines of the time limited their effeciencies due to the fact that the working fluid transferred its kinetic energy to only a portion of the usable surface area. He believed that instead of utilizing only parts of the turbine surface (e.g. with fan blades), that one could use the nearly the enitire surface area (with disks). The turbine works due to the aerodynamic principal of the boundary layer, first presented in a paper in 1904 by Ludwig Prandtl. That is, that a fluid moving across a surface has a small amount of fluid that will adhere to that surface, allowing the rest of the fluid to move past. Over very smooth surfaces (laminar surfaces), the boundary layer is thin and does not become turbulent, however, as the surface becomes rougher, the boundary layer becomes thicker to the point where turbulence develops, and compromises the airflow. 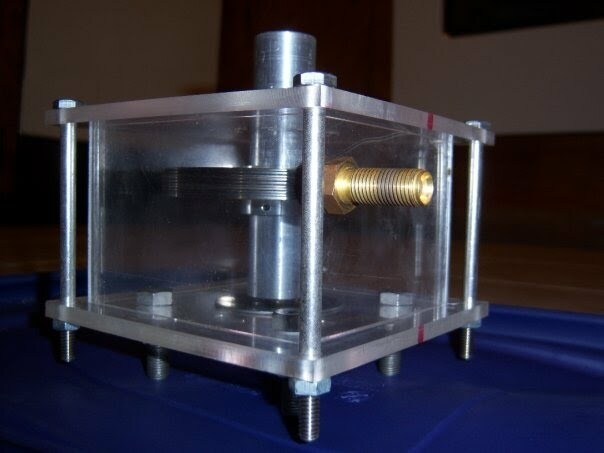 The design of the Tesla Turbine was fairly straight forward: 1)The disks were harddrive platters with holes drilled around the center, 2)The shaft was made from an aluminum rod, 3)The bearing was an large Industrial bearing, 4) The housing was made from plexiglass tiles, and 5) The spacers were to be small rubber spacers taken from the ends of water balloons. When the design was tested in the industrial bearing, the turbine barely rotated at all. Therefore, we decided to not use the industrial bearing and instead use a harddrive bearing. Also, after researching on the internet, we decided that the gap spacing should be in the neighborhood of 1/100-30/1000 of an inch thick. Therefore we decided to use paper spacers around the center of the disk. This week we tried to do a test run of the turbine on the large industrial bearing. Using regular shop air, we found that the bearing had too much inertia in its bearings. Believing that the bearing was loaded with grease, we opened the bearing only to find that no grease was in the bearing. Therefore, we instead decided to use the bearing from a malfunctioning computer hard drive. This worked out perfectly though because the hard drive bearing fit perfectly into the shaft hold in the bottom plexiglass plate. Then a washer was fitted and drilled to ensure that the bearing would hold in the bottom plate. Also to connect the turbine shaft to the hard drive bearing, the shaft was drilled and tapped with a 4/40 size screw hole. Then a 4/40 size screw was acquired and the head of the screw taken off. After it was ground and buffed, it was screwed into the shaft of the turbine. After the addition of a small nut to the screw, the screw was then screwed into the slot in the center of the bearing. With the shaft attached to the hard drive bearing, the turbine finally became more of a reality. This video shows that. we conducted our first test run using paper spacers, only to find that although it ran much better than in the industrial bearing, it was still a tad sluggish. Since we are essentially using the top plate as another bearing for the shaft of the turbine we sprayed some WD-40 on the shaft around the top plate center hole. We then conducted a second test run, and whoa, this little engine flew...FAST. Where D = gap size, n = fluid kinematic viscosity, and w = rotor angular velocity." Therefore, if we want high turbine speeds, then we want to decrease the disk gap as much as possible. Because of this, Dr. Bruton and myself decided to remove the rubber spacers, and return to the paper spacers. This week Dr. Bruton and I stopped "dry test runs" of the turbine and actually determined the angular speed as well as the generate a little electricity. This was accomplished using a set of rare earth disk magnets, an oscilloscope, and a small homemade copper coil. First we tried to determine the frequency with a strobe light. This proved infeasible because the turbine accelerated at such a high rate that it was nearly impossible to determine its speed at any given time. Therefore, Dr. Bruton elected that we use a multimeter and/or oscilloscope. We began by attaching the 2 rare earth magnets on opposing sides of the turbine shaft with duct tape. We tried to make them as aligned as possible, so as not to make the turbine shaft unbalanced. After the magnets were secured with duct tape, the coil was placed with the coils wound perpendicular to the magnetic field lines. The leads of the coil were then attached to the multimeter, and the shop air was engaged. The video can be seen here. Next, since the frequency was still hard to determine, we instead placed our trust in the all-powerful oscilloscope. We changed the connection for the coil's leads from the multimeter to the oscilloscope. After one run, Dr. Bruton decided that it would be prudent to place the video camera in a place that could see the oscilloscope screen effectively. During this run, we determined that the speed of the turbine was approximately 15,000 rpms, and produced a voltage of about 8 volts AC. Our final run can be seen here. Our last task this week was to procure an electrical generator from SFA observatory to see how much electricity could be generated. Once the generator was taken down, I tried to turn the shaft, only to find that there was a fair amount of inertia in the bearings. Therefore, when we do try to run the turbine, it will have to be geared to produce the correct amount of torque to turn the generator. This will inevitably reduce the frequency of the generator, however, it will be interesting to see how much can be generated from a small 3 inch diameter turbine. This week we tried to unsuccessfully attach the turbine shaft to the DC generator. The main problem is the fact that the shaft of the DC generator needs quite a bit of torque to get up and going. Our first attempt was to attack a small disc to the Generator, however, while this friction drive system did work, the turbine struggled to turn above 30 rpms. We have tried to find another larger disc to attach to the shaft of the generator, but still have not found anything. 1) What exactly is a Tesla Turbine (How does it work)? A Tesla Turbine is a bladeless disc Turbine that works on the aerodynamic principle of the boundary layer. 2) What is the difference between a Tesla Turbine and a traditional turbine? 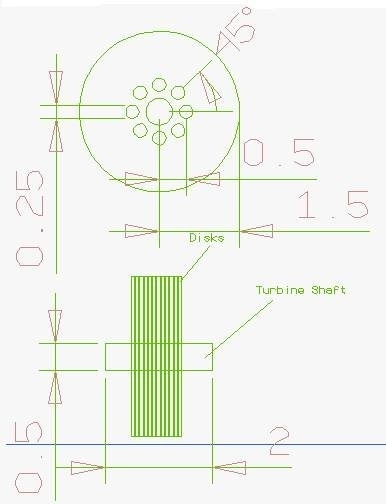 In a traditional turbine, the fluid flows perpendicular or parallel to the turbine shaft. In Tesla's turbine, the fluid flow is perpendicular to the turbine shaft. 3) Why should anyone study a Tesla Turbine vs. any other type of turbomachine or heat engine? Tesla's turbine was the created to be more efficient than other turbines of the early 1900s mainly due to the fact that the manufactured bladed turbines had poor aerodynamics compared to the bladed turbines today. However, Tesla's Turbine has advantages in the fact that it is much more simple to construct, and if the disks have laminar flow (basically no rough surface to disrupt the boundary layer), then efficiencies of 95% are possible. 4) What are some of the key mathematical/physics/engineering concepts involved with the design? 5) Where can Tesla Turbine technology be applied? The Tesla Turbine has applications anywhere a traditional turbine can be used. Interestingly enough, however, it can also be used as a pump as well. 6) What are some improvements that can be made on the design or what future design improvements could be made to the turbine? Since the disk gap changes based on the angular velocity of the turbine, perhaps some kind of multi-stage tesla turbine could be used. Also, the disks should be made so that the edge is more aerodynamic and does not disrupt the boundary layer flow, as well as that the disk itself is very smooth (polished). 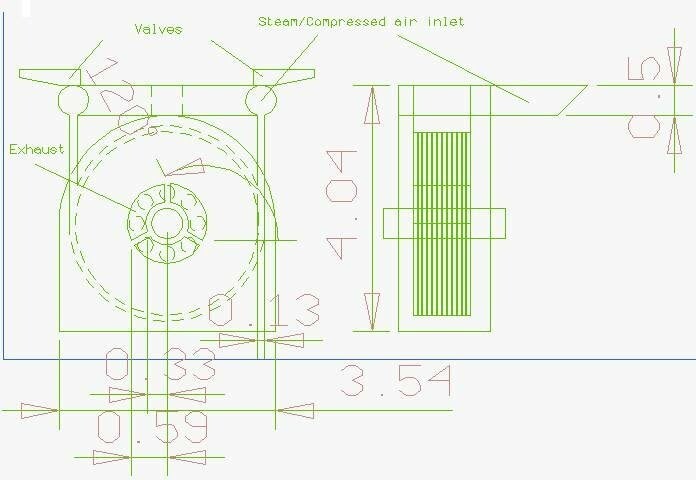 Today, I found an 80mm brushless DC computer fan, that looked very similar to turbines used in steam power plants. Starting out with around 30 PSI of air, I fired the compressed air first axially, then radially. What I noticed was a very familiar sound, that loud high pitch of a turbine engine. Next, I tried the Tesla turbine (with its housing off). There was hardly any sound, the only sound being the vibrations of the metal bolts acting as stands for the turbine, which was minimal and nonexistent if the turbine was held off the table. I also discovered today that, with the Tesla Turbine enclosed in the housing, it needs a minimum inital air pressure of ~35 PSI, but will run at low rpms at 30 PSI. However, If the housing is removed it can be run with as little as 20 PSI. Both the DC fan and Tesla Turbine were run today with no load.